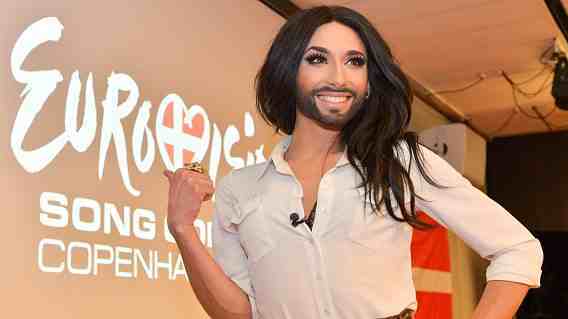 Any ideas for the post on my return to this blog (after ‘time out’ at HaikuCity2014) were superceded last night by the winning of the Eurovision Song Contest by Conchita ‘Wunderbar’ Wurst of Austria. Dubbed the ‘Bearded Lady’ and drag artist, this amazingly-androgynous, gender-blending singer with a belting voice, super-trimmed facial hair and lashes-for-days was the deserved winner with her song ‘Rise Like A Phoenix’. Just as transwoman (and first transgender) contestant, Dana International caused a stirring of the Eurovision ashes in 1998 when she won for Israel, such celebrity winnings become ‘a phoenix of hope’ for trans people. For me as a transgenderqueer individual striving for the acknowledgement of ‘person’ as the operative identity of any&everyone – rather than a binary gender identity of male or female – the vision of gender-busting Conchita singing-to-win was intensely moving. Enjoy these ‘transishews’ links (again)!